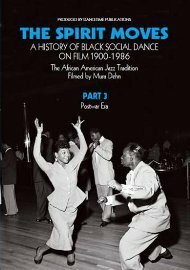 The Spirit Moves is a documentary film by Mura Dehn chronicling the evolution of African American social dance throughout the 20th century. It consists of many hours of rare archival footage shot over the course of thirty years. The complete version is only available at a select few institutions. In 2008 the first three parts of Dehn's work, totaling two hours, were remastered and released on this DVD set. It's a must see for any swing enthusiast. Part 3: Postwar Era is filmed at P.S. 28 (Brooklyn) and the Palladium (New York City) and focuses on dances from the Bebop era. Dance demonstrations include the Flying Home Harlem Style, Bebop improvisations, the Mambo, and an Applejack Challenge.